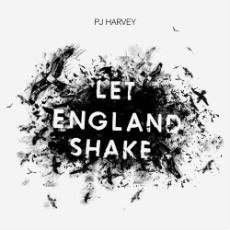 PJ Harvey's latest effort Let England Shake is almost a soundtrack for the great England itself. It has a haunting, dark somewhat sad feel to it. The theme of love/hate is apparent throughout the album. "let's all be better" is a constant reminder for this country I love soundtrack. PJs poetic side is in each of these songs - and if you pulled one of the songs from the album it just wouldn't feel right. For me the stand out tracks are The Words That Maketh Murder, Written On The Forehead and England. So "England you are great but you need to stand up" Let England Shake is out via Vagrant Records Feb 15th. It took a few listens on my trips about town, but I like it. Very distinct from her previous albums.